Editor’s note: With the Syrian city of Homs under siege, CNN interviewed an opposition activist using the pseudonym of “Danny” to find out more about what was happening on the ground. Danny, whose real name CNN is protecting, escaped the slaughter. CNN traveled to an undisclosed location recently to interview activist Danny. For his safety, we are not disclosing where that was, and Danny has since moved. Before leaving Homs, Danny shared his stories with CNN and posted videos on YouTube purporting to show the violence in Syria. CNN cannot verify these videos independently, but they appear to show a desperate situation. CNN’s Nick Paton Walsh caught up with Danny to ask him about what’s going on in Syria, what scenes keep him up at night and what he hopes will happen. There are many things Danny wants the world to know about what he and others in the Syrian city of Homs have gone through. But mostly, he wants people to know it has gotten so bad, and so many people have died that it has become the norm in that town. “What people have to see is the children getting killed. Not just the children, but when someone dies and the relatives get used to it,” Danny says. “He said he wanted to write on my Dad’s body, on the sheets, his name so I don’t lose it between the bodies. The scenes that have played out before him can keep Danny up all night. There are situations and people whom he remembers vividly. “I’ve seen lots. You would not imagine. If I would go on about what I’ve seen, it would take me hours. “What about the kid we picked up who’s got no jaw left and he’s still alive? What about the kid that’s lost his two legs, and he’s still alive? What about the kid who’s lost his arms? My friend who’s paralyzed now? My friend who’s lost his arm? My friend who lost an eyeball? My friend who got hit by a (sniper’s bullet) that went in his mouth and went out … (who) lost his teeth? “These are all people who are scarred for life. I would rather get killed than be scarred like that. “That’s what people are scared about now – not dying. We’ll die for our country. It doesn’t matter. Danny has been an outspoken advocate since the breakout in violence. And he has made strong pleas to President Barack Obama to help Syrians. “I would beg him to help us. Military forces, or weapons, or by a ‘no-fly’ zone. We want help. We can’t stay like this – Bashar al-Assad will kill millions. He has no problem. “This can’t be solved peacefully. We’re asking anyone for any kind of help. CNN asked Danny if he was concerned radicals could hijack his movement if the conflict dragged on. “Listen, this revolution is for the Syrian people. It’s not for the Muslim Brothers, it’s not for anybody. It’s for everybody. Kurds, Muslims, Christians, Sunnis – it’s for everybody. This revolution is for the Syrian people. We started it; we will end it. Danny said he believes history will show China and Russia share in the responsibility for deaths in Syria after their Security Council veto of a U.N. resolution condemning violence in the country. “It’s a crime against humanity. … Russia and China will be dealing with that. They have Syrian blood on their hands. This is all their fault. 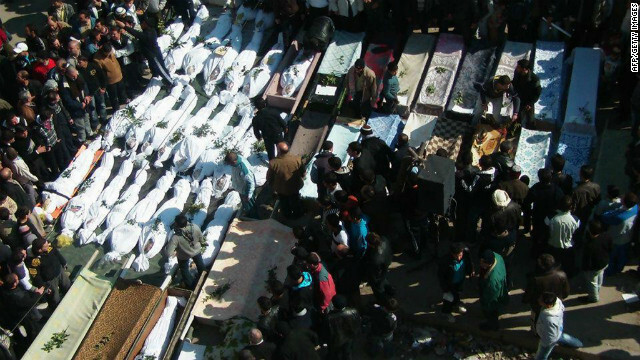 “The last time the U.N. did nothing they gave the green light to Bashar al-Assad to kill more. “It was the first time that he used rocket launchers – after the U.N.
“He felt safe. They gave him the OK.
Editor’s note: Muhammad Zuka, a pseudonym, is a Syrian resistance leader in his mid-30s from the Qalamoun region, north of Damascus. He owned a small business but lost it in the crackdown. He recently participated, with six colleagues, in a Skype call with U.S. journalists and others hosted by the Foundation for Defense of Democracies. This commentary was translated from Arabic and facilitated by Ammar Abdulhamid, author of the daily blog Syrian Revolution Digest and a foundation fellow. Ken Ballen, author of the book “Terrorists in Love” (Free Press, 2011) and president ofTerror Free Tomorrow, a nonprofit institute that researches attitudes toward extremism in Syria and elsewhere, also assisted. North of Damascus, Syria (CNN) — The Syrian revolution has taken place as a long-delayed response to the misery and helplessness visited upon the Syrian people by a narrow authoritarian clique that treated the country as its own private fiefdom. Occurring within the context of the Arab Spring, and considering what world leaders already knew about the nature of President Bashar al-Assad’s regime, protest leaders had believed that world reaction would be far more sympathetic to our desire for freedom. Unfortunately, we were wrong. The world has been slow to condemn al-Assad’s atrocities and sanction his behavior. Worse, the international community has failed to develop a plan or vision of what should come next. Syrian protesters have been entirely left to our own devices, to fend for ourselves against a barbaric regime actively supported by its historical allies. We have tried to appeal to the world, to argue our case in the arena of international public opinion and to suggest courses of action, using the Internet and YouTube videos, and by talking to the few foreign correspondents who managed to find their way to us. Meanwhile, our suffering increases under the weight of the violent and brutal regime crackdown. International sanctions have been inadequate to stop the bloodshed and could easily backfire when there is no endgame in sight. When the death toll reached 5,000 and the number of detainees 50,000, we were finally forced to resort to violence. Our protests started entirely peacefully. Yet after months of seeing unarmed protesters mowed down by tanks and children targeted by snipers, we needed to start defending ourselves. Defectors from al-Assad’s loyalist army joined with us and have led to the establishment of the Free Syrian Army. Stopping our resistance is no longer an option. Talking to al-Assad and the people who drove us to the brink, who called us “infiltrators,” “germs” and “terrorists” is tantamount to betraying everything we have stood for. Al-Assad’s promises of reform sound as disingenuous now as they did when he first made them in 2000. Today, as the regime’s brutality increases and entire residential neighborhoods and towns are being targeted indiscriminately with howitzers and tanks, we are more committed than ever to defending ourselves while protecting the civic nature of our movement. For those who doubt our ability to do this, just remember that not a single massacre or act of revenge has taken place in any of the communities that have been under the control of the protesters. The regime makes claims and spreads rumors but offers no verifiable proof. Meanwhile, its atrocities have been meticulously documented by our colleagues and more recently by the foreign correspondents who gained access to the country. The world has no reason to be afraid of us. This revolution was launched to reclaim the future for freedom and democracy. For this, we should be engaged and supported. We are not one color, but a rainbow, committed to protecting our national diversity and the values of tolerance for which Syrian society has always been known — not because the world wants it, but because it is our heritage. Had we had any other agenda, the world would have already seen signs of that on the ground. It has been almost a year since the revolution began, yet, despite the regime’s provocations, we remain committed to national unity, and we shall not waver. • Engage the protest leaders on the ground, for we are the ones responsible for ensuring that this revolution remains committed to civic and democratic values. • Help establish humanitarian corridors to embattled Homs communities, where the specter of famine grows by the day, and where residential neighborhoods are getting bombarded around the clock. We know these are not simple or easy demands. But it’s clear by now that, long before the Russian and Chinese vetoes of the U.N. Security Council resolution, international reluctance and confusion have given al-Assad’s regime a green light for further escalation. Today the death toll is approaching 8,000, with 60,000 detained and 20,000 missing. When will it be the right time to help us? What other option is there that hasn’t been tried yet?